During the previous years, the 30-cm reflector-type telescope, which was permanently installed at the Observatory dome, is being used for the telescoping sessions. However, in May 2001, the Japanese Government donated a computer-based 45-cm telescope and was installed at the Observatory. Starting on February 16, 2003, the start of the celebration of the National Astronomy Week, the telescope is open for public use, after a series of adjustments made by the Japanese technicians. Provided that the sky is clear, visitors can expect to have a glimpse of the famous bright stars like Vega and Sirius during the stargazing session. Planets such as Jupiter, Venus, Saturn, Mercury and Mars, including their satellites and the Moon can also be observed. For residents of the cities of Davao, Cagayan de Oro, Cebu and Legazpi, stargazing and telescoping sessions can also be conducted at the PAGASA regional centers located in their area. One (1) 25-cm telescope in each of the above-mentioned sites are available for use. These telescopes were procured in May 1998 through the Grant-in-aid (GIA) project of the Department of Science and Technology (DOST), which is entitled "Promotion of Astronomy". The history of astronomy in the Philippines since it started in 1897 will be described. The development of astronomical resources, activities and education after its hundred years of existence will be emphasized. Work in astronomy in the Philippines started in 1897. It was one of the functions of the "Observatorio de Meteorologico de Manila" (OMM), which performed not only meteorological and astronomical services but also seismological and terrestrial magnetism services. Its astronomical activities were mostly limited to timekeeping and observation of solar and stellar phenomena. 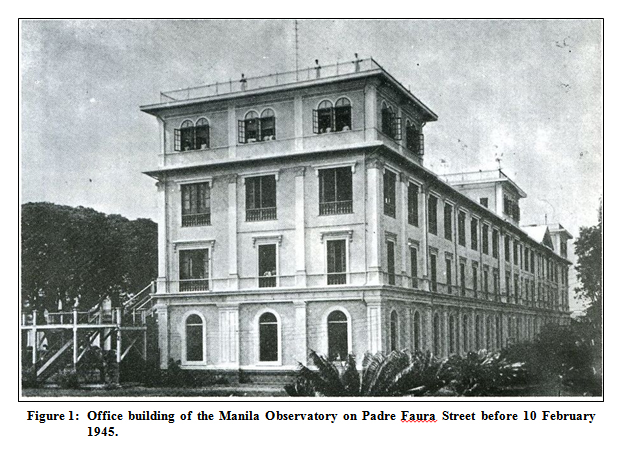 The OMM began as a private institution in 1865 and became a government agency as the Weather Bureau in 1901 with its observatory in Manila as its central office. During the Second World War, the astronomical observatory was destroyed and a new observatory was constructed within the campus of the University of the Philippines in Quezon City in 1954. 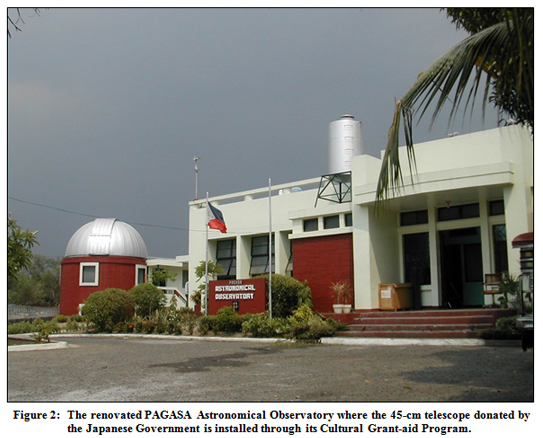 It remained there up to the present time, now under the Philippine Atmospheric, Geophysical and Astronomical Services Administration (PAGASA), as the only government observatory. From 1954, the observatory has not seen any major change until 1998. The construction of a planetarium in the PAGASA Science Garden in Quezon City in September 1977 is the only addition to the facilities of the agency . Likewise, its activities are practically the same, except for the publication of astronomical data and the conduct of occasional telescope and stargazing sessions up to 1993. At present, there are only two institutions in the country that perform astronomical functions. These include the PAGASA and the National Museum (NM) Planetarium, a government institution, which is under the auspices of the Department of Education (DepED). The succeeding paragraphs describe the development of astronomical resources and activities in PAGASA and education in the Philippines. PAGASA is presently under the supervision of the Department of Science and Technology (DOST) and is composed of nine branches or divisions, which in turn is composed of sections. A section in astronomy is under the Atmospheric, Geophysical and Space Sciences Branch (AGSSB), which is basically the research and training arm of PAGASA. The Astronomy Research and Development Section (AsRDS) is staffed by 19 professional-level employees who hold college degrees and graduate studies and by 16 sub-professional-level employees. 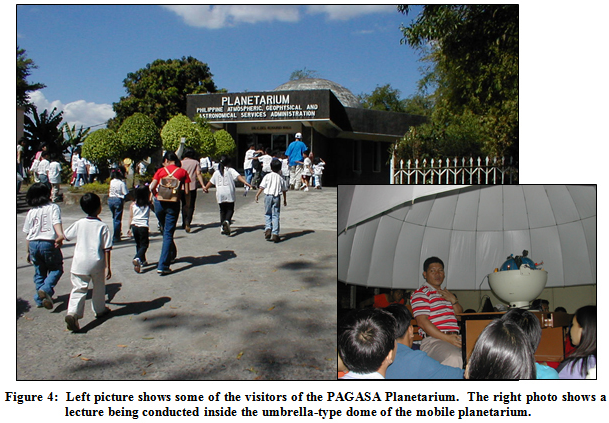 As earlier mentioned, PAGASA has an astronomical observatory and a planetarium, which are both managed by AsRDS, AGSSB. In addition to its seven (7) small telescopes of various sizes, the largest of which is the 30-cm, the observatory acquired five (5) 25-cm and an 18-cm MEADE telescopes in 1998. Four (4) of the above-mentioned 25-cm telescopes where distributed to Legazpi, Cebu, Davao and Cagayan de Oro, the four regional field stations of PAGASA that are located at various parts of the country. The telescopes were being utilized to promote astronomy in the countryside. The greatest addition to the observatory is the 45-cm telescope that was donated by the Japanese Government through its Cultural Grant-aid Program. To be able to accommodate the donated telescope and its accessories, the observatory was renovated in 1999. It was installed in 2000 and was inaugurated in 2001, replacing the 30-cm reflector type telescope that was formerly installed thereat. The donated telescope has a photometer and a spectrograph as its accessories. Unfortunately, in 2003, the photometer was stolen at the observatory. 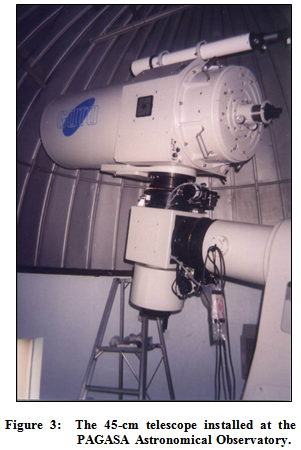 In 2001, Gunma Astronomical Observatory (GAO) of Japan donated an ST8 CCD. The spectrograph was also repaired so that the donated CCD could be attached to it, instead of a photographic camera. In addition to telescopes, the observatory is also equipped with a Rb/GPS Timing System that replaced the old quartz clock on 20 February 2004. The timing system is being utilized for determining the Philippine Standard Time (PST) up to the nearest tenth of a second. The atomic clock is also equipped with a Network Time Protocol (NTP) system that allows the general public to check their time pieces through the Internet. The PAGASA Planetarium at the Science Garden can seat 100 people. The AsRDS personnel give astronomical lectures to visitors, who are mostly students and teachers in elementary and high schools. Minor repairs were done inside the dome of the Planetarium in 2005 including the replacement of its worn-out chairs. Such renovation enabled the agency to increase the entrance fee being charged from 0.10 to 0.50 cents that is being used to help defray part of the maintenance expenses. In as much as most of the astronomical facilities of the country are located in Luzon, particularly in Metro Manila, the children and other astronomy enthusiasts who live far from these places are being deprived of making use of the said facilities. With the objective of reaching more people in the countryside thereby promoting astronomy to a greater number of people at a lesser cost, a mobile planetarium was acquired by the AsRDS in 1999. The said planetarium has been traveling to various places upon request of interested parties on a first-come, first-served basis. Requesting parties in return shoulder all the expenses pertaining to the activity. The principal activities of the AsRDS consist of sunspot and lunar occultation observations and observations of the satellites of Jupiter and the transits of Mercury, of comets and other planets. It also observes astronomical phenomena that are seen in the country. With the approval of the application of the Philippines as Associate Member of the IAU during the General Assembly in Manchester in 2000, a cooperation between the IAU/TAD and PAGASA was signed in 2002. In 2003, an astronomical observation program was established at the observatory through the assistance of Dr. Armando Fierro, a visiting lecturer of the IAU/TAD. Hence, in 2004 through 2006, the AsRDS personnel conducted variable star observations using the 45-cm telescope and CCD. At present, reduction of data is being done using the IRAF software. The AsRDS also publishes data that are derived from computations based on subscribed international publications. The publications are one of the principal sources of income of AsRDS. The other important activity of AsRDS is time-keeping. The agency was designated by law to be the official timekeeper of the country. Hence the Rb/GPS Timing System previously mentioned is used to perform this mandate. Lastly, AsRDS engages in the promotion of astronomy, including space science in the Philippines, through its planetarium shows and publication of astronomical posters. Its staff conducts and/or serves as resource speakers in lectures and seminars on astronomy and stargazing and telescoping sessions in various parts of the archipelago. It coordinates and collaborates with other agencies or institutions in this field, such as the fifteen (15) organizations of astronomical societies in the Philippines. In 1997, in celebration of its centennial year in astronomy and also to promote the science, various revitalizing activities in astronomy were conducted. Some of these include the information, education and communication programs in astronomy press releases and radio/TV interviews, seminar/ workshops for science teachers and students, grant of honor and recognition awards to five outstanding Filipino astronomers and conduct of Astro Olympiad, a contest in astronomy . Astronomy is taught as a part of the general science subject in elementary schools where it is normally given a three-hour per week period in Grades V and VI classes in the Philippines. It is an elective subject, which is taken in one semester (four months) in the first year high school level. Before 2002, there is no single university in the country that offers an astronomy course. In School Year (SY) 2002-2003, the University of the Philippines through its National Institute of Physics offered an astronomy subject entitled "Physics and Astronomy for Pedestrians" . SY 2005-2006 marked a great change in the history of Philippine education in the field of astronomy. For the first time, the Rizal Technological University (RTU) offered a graduate program leading to a degree of Master of Science in Astronomy. The course, which is descriptive in nature, is designed for students with any B. S. degree, who are interested in astronomy. The RTU has taken undisputed leadership in the field of Space Education in the country. Hence, on the first semester of SY 2007-2008, a 5-yr Bachelor of Science in Astronomy Technology will be offered in the said university. The course will introduce astronomy to younger people who will make science and technology their lifetime careers. The designed course is customized to be wide in scope where research and observation will be given priority, to push the frontiers in these fields at least in the Philippines for the meanwhile. In PAGASA, the personnel of the AsRDS who are performing all the previously mentioned astronomical activities do not have a formal education in astronomy. The knowledge in astronomy that they possess is obtained through the infrequent in-service training courses conducted by the agency and through the books that were procured, usually from overseas sources. The Chief of AsRDS, undertook a course on Astronomy and Astronomical Observation at GAO in 2001. Seven (7) personnel also participated in the International School for Young Astronomers (ISYA). Three of them attended the ISYA held in Thailand in 2001 while the remaining four are attending the course, which is presently being held in Malaysia. The signing of the Memorandum of Agreement between the IAU/TAD and PAGASA in 2002 led to the conduct of the Astronomers Training Course in the agency in 2003. Five (5) visiting lecturers of the IAU delivered lectures on various topics. PAGASA is still waiting for the availability of a lecturer to complete the course. Three (3) astronomy personnel are also presently pursuing an M. Sc. degree in Astronomy at RTU. They are expected to finish the course in 2009. An AsRDS personnel is also presently completing a course on space science in India with a research topic on variable star photometry. In the last quarter of 2007, another personnel of the astronomy section will undergo and On-the-Job Training on Outreach and Astronomical Research Activities at GAO. The activity will be made possible by a cooperation between IAU/TAD, GAO and PAGASA. Given the preceding information on the past and present resources, activities and education in astronomy in the Philippines, it is not difficult to make a projection of the status of the science in the near future. In 1996, it was foreseen that, in the next decade, the development of astronomy in the country will remain as lethargic as it has been for the past four decades, unless drastic positive changes were implemented. 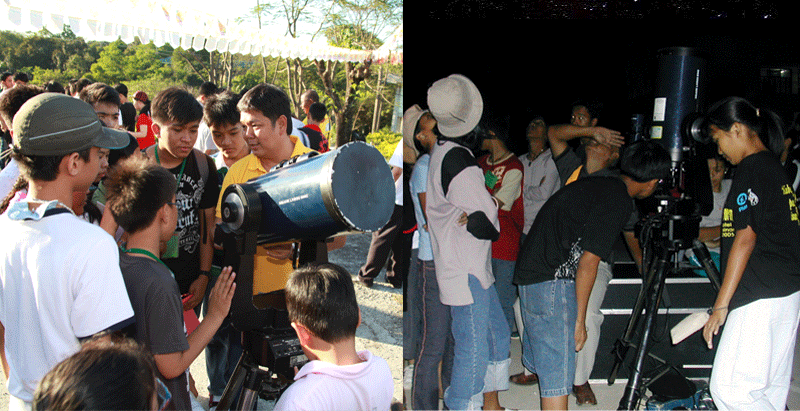 With the successful implementation of some of the revitalizing activities that were planned in 1997, particularly the installation of the donated 45-cm telescope and the enhancement of astronomical knowledge in astronomy of the PAGASA personnel as well as other astronomy enthusiasts, the Filipinos can always hope for a better and brighter future for astronomy in the Philippines. B.M. Soriano, Jr. and C. P. Celebre, Astronomy in the Philippines, Developing Astronomy And Space Science Worlwide, Germany, September 1996. C. P. Celebre and B. M. Soriano, Jr., Revitalizing Astronomy in the Philippines, Astronomy For Developing Countries, Manchester, United Kingdom, August 2000, pp.49-58. C. P. CELEBRE, The Establishment of an Astrophysics Course in the Philippines thru the IAU TAD, 8th IAU ASIA PACIFIC MEETING, Tokyo, Japan, July 2002. The Planetarium at the Science Garden has an 88-seating capacity. It offers an ideal setting for all kinds of cosmic educational tours, whose most important task is to give the scientific concept of the Universe to the general public, and to elementary and high school students. This concept includes the size and content of the observed universe, its creation, history and possible future, the development of the solar system. The PAGASA Mobile Planetarium includes lecture, film showing, lecture proper and stargazing/ telescoping sessions. An inflatable mobile planetarium is a replica of the fixed planetarium in PAGASA Science Garden. It has a maximum capacity of fifty (50) participants per lecture. Written requests for the use of PAGASA Astronomical facilities [Planetarium (fixed and mobile) and Astronomical Observatory] shall be filed at the earliest possible time, at the Office of the Chief, Space Science and Astronomy Section (SSAS) with Tel. No. 434-2715. The request shall indicate the place/facilities to be visited in PAGASA, indicating the number and grade level of the students, the date and the time of visit. The same format shall be followed in case PAGASA equipment will be brought outside the premises of PAGASA. Requests will be considered on a first-come, first-served basis. The duration of Planetarium lectures and demonstrations for college students/teachers/ professionals is 1 hour, 45 minutes for secondary or high school students and 30 minutes for elementary, kinder and nursery pupils. The maximum number of persons that can be accommodated at one time should not be more than 100. For the PAGASA Observatory, visitors should indicate if it is an overnight stay at the Observatory. Tour coordinators/teacher coordinators shall re-confirm their reservations at least a day before the scheduled date and this applies to cancellation or postponement of the same. Confirmation should be done through telephone numbers 927-5509 and 929-1237 of the Planetarium and PAGASA Observatory, respectively. Admission Fee for the fix Planetarium and PAGASA Observatory is PhP 25.00 per head. A down payment of 50% as reservation fee should be paid to the Cashier’s office upon the issuance of the concerned section of payment acceptance order for them to be able to secure permit. The official receipt and the permit shall be presented to the Planetarium personnel at the scheduled day and time of visit. This payment is non-refundable with the exception of a few cases such as equipment breakdowns or brownouts. However, such amount may be applied for future requests in case of cancellation of the schedule due to force majeure like suspension of classes and/or work at offices. This rule only applies to visitors whose addresses are within Metro Manila. Scheduled visitors should arrive on time. If a group fails to come on time, its slot will be given to the next group who has a valid reservation. However, should the former group wishes to wait for the accepted group to finish its lecture, it may do so as long as no conflict for the scheduled lectures arises. Cleanliness in the premises should always be observed. Smoking and eating within the lecture area are prohibited. Likewise, smoking, eating, drinking and taking of pictures are prohibited inside the Planetarium lecture room. Tour Coordinators/Facilitators are required to register their time of arrival and departure at the guard house. The Planetarium and Astronomical Observatory personnel reserve the right to cancel any scheduled visit due to any of the following reasons. Unruly behaviour of the group. Emergency case, such as equipment breakdown and lecturer’s ill condition or state of health. Excessive number of reserved students. Fifteen minutes late from scheduled visit. The PAGASA will not be liable for any accident that may occur within the PAGASA premises due to the negligence of the tour coordinator/teachers or occurrence of natural disasters. For PAGASA Planetarium-on-Tour package, which includes Mobile Planetarium lecture, film showing, lecture proper and stargazing/telescoping sessions, the requesting party shall shoulder the following expenses: rental fee of PhP 1,500.00 per day for the mobile planetarium and PhP 500.00/telescope. Payment should be made through the PAGASA Cashier’s Office located at the 3rd floor of the PAGASA Central Office Bldg. in Science Garden. Expenses will also honorarium of lecturers, traveling and per diem allowances, and incidental expenses such as toll fee, diesel/gasoline and driver’s per diem if provided with a PAGASA vehicle. The PAGASA Astronomical Observatory which is located inside the campus of the University of the Philippines, Diliman, Quezon City. It is equipped with a 45-cm. computer-based telescope donated by the Japanese Government thru its cultural- grant-aid program. It is the biggest ever acquired by the PAGASA since the establishment of the observatory in 1954 and is now the largest operational telescope in the country. It is very powerful that astronomers and astronomy enthusiasts may now conduct effective observations of stellar bodies and other distant space objects. The principal activities at the Observatory are observations of sunspots, lunar occultations, planets and stars. It also makes observation of the satellites of Jupiter and the transits of Mercury, comets and the other planets. At times when there are occurrences of significant astronomical phenomena like eclipses, appearances of comets and meteor showers, the Observatory is filled with visitors. Likewise, it is a venue for the educational field trips of most schools in Metro Manila and other provinces for their requests of lectures, stargazing and telescoping sessions. Overnight stargazing and telescoping sessions are conducted at the Observatory upon request. From 1980 to 1984, the observatory made observation of variable stars. It observes astronomical phenomena that are seen in the country such as the three total solar eclipses in this century, which path of totality crossed the Philippines. The Philippine Atmospheric, Geophysical and Astronomical Services Administration (PAGASA) is mandated by law, as the government agency tasked to keep and disseminate the Philippine Standard Time (PhST). The Time Service Division was established as one of the major units in the then Weather Bureau sometime in 1949. Its master clock was a U. Nardin Marine Chronometer, with pendulum regulator, which was utilized as a dispatch clock. A short synchrome ensemble replaced the marine chronometer in 1951 and a quartz crystal clock improved the system in 1965. Since then, there was no major improvement that had been done with the system, except for the acquisition of a Digitizing Oscilloscope. In 1988, the Time Service Division was downgraded to the Time Service Unit (TSU), together with the reorganization of the PAGASA. In 1996, the TSU acquired a Luminous Digital Clock and a Global Positioning System (GPS), which were installed in 1997, as its primary reference timing system. 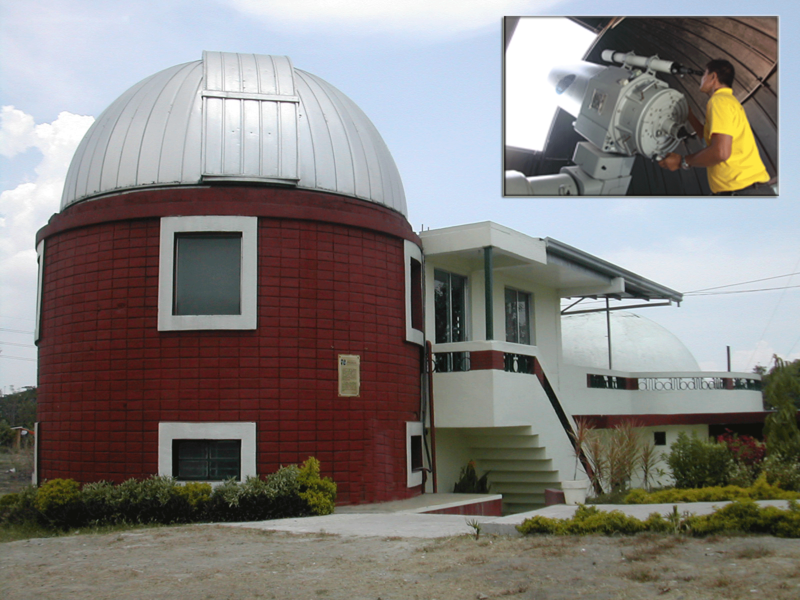 In 2003, TSU was transferred to the newly renovated Transit Building of the PAGASA Astronomical Observatory, equipped with the new timing equipment, known as the Rubidium/Global Positioning System Common View (Rb/GPSCV) Time Transfer System. The said time equipment was decommissioned by the unit after it was hit by a lightning on June 09, 2013. An alternative time source had been obtained by PAGASA through the ICT group, ETSD by acquiring two secondary frequency standards that were installed at the WFFC building and at the Planetarium Building. The first is used to disseminate the PhST via NTP and the other one is utilized as a back-up. Another back-up support is a 5225B Time Node made by Oscilloquartz that was installed at the PAGASA Astronomical Observatory, in case the two S350’s bogged down. In 2015, PAGASA acquired a new time equipment known as the PAGASA’s Precise Time-Scale System. This timing equipment is an independent timing chain (real-time clock) consisting of three high-performance cesium clocks, real-time clock steered to UTC using GNSS timing information, distribution for 5 MHz, 10MHz, AM/DC IRIG-B, 1 PPS and NTP. It is a world class timing system comparable to the best national time laboratories with commercial and hardware support. The new timing equipment was purchased by PAGASA to establish a national timing reference and to satisfy the requirement of the existing laws on time and frequency services in the country. 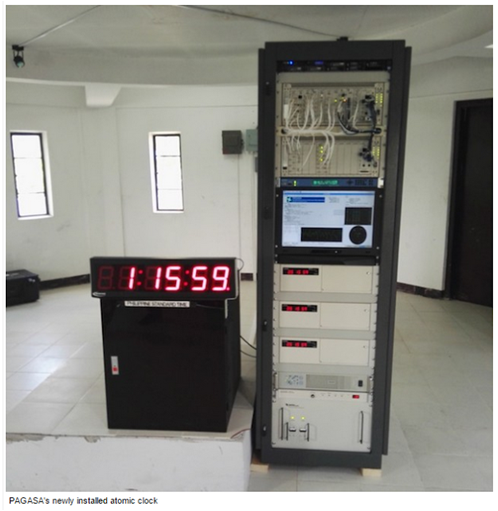 The time equipment was about the size of a large refrigerator, composed of three high performance of atomic cesium clocks for holdover redundancy and is plugged into the network time protocol (NTP) of the Philippine Standard Time. The atomic clock tells the time by measuring the oscillation of energized atoms in an electromagnetic field. The time equipment is also capable of serving as a stratum 0 Network Time Protocol (NTP) server, providing Internet time dissemination. NTP is a means of synchronizing computer clock over the Internet. With this system, the Philippine Standard Time (PhST) kept by the time scale system, will be available on-line in the PAGASA website, and the NTP program will allow transfer of this time to clients accessing the site. Government and private TV stations shall be encouraged to avail of this service and pass on to the general public, through their regular time checks and their clocks shown on the TV screen, derived and synchronized time with PAGASA’s Precise Time-Scale System. Radio stations shall then be requested through the Kapisanan ng mga Brodkaster ng Pilipinas (KBP) to copy the time being broadcasted by these TV stations to provide an accurate and timely nationwide coverage of the PhST. 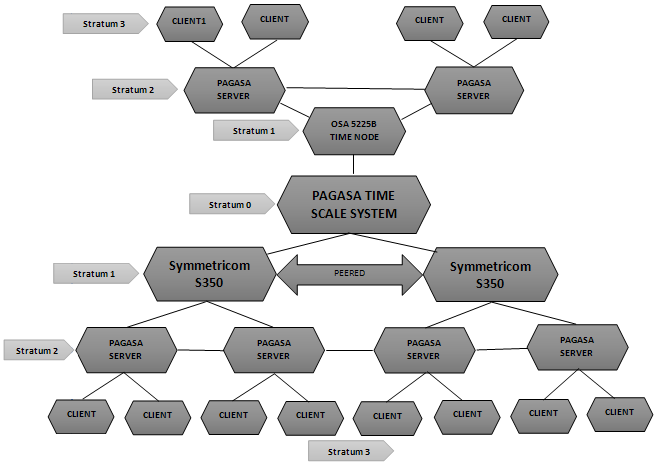 Symmetricom S350s and OSA 5225B Time Node, whose system clocks are synchronized to within a few microseconds to PAGASA’s Time Scale System. These are servers that are peered to each other for sanity checking and backup. Batas Pambansa Blg. 8, an act of defining the metric system and its units, providing for its implementation and for other purposes, under section 6b, states that: "PAGASA shall be responsible in the establishment, maintenance and operation of the National Standard for the second of time". Presidential Decree 1149, assigning PAGASA as the official agency that will serve as the official time service agency of the Philippines. Republic Act No. 10535, ‘The Philippine Standard Time (PhST) Act of 2013, requiring all national and local government offices to display the PhST on their official time devices, including bundy clocks, in accordance with the official time being provided by the PAGASA using its Network Time Protocol. Maintains the national standard of time and frequency. Disseminates the precise time and frequency via Internet, radio broadcast and other means. Extends time synchronization and standardization services to industrial and scientific institutions. Exchanges data on time and frequency with overseas institutions. The Philippine Atmospheric, Geophysical and Astronomical Services Administration (PAGASA) is mandated by law, as the government agency which is tasked to keep and disseminate the Philippine Standard Time (PhST). Section 6 of Batas Pambansa Blg. 8, defining the metric system in the country, states that: "PAGASA shall be responsible in the establishment, maintenance and operation of the National Standard for the second of time". Another law is Presidential Decree 1149, assigning PAGASA as the official agency that will handle the dissemination of the Philippine Standard Time (PST). Recently, the Philippine Standard Time Act was created. Later, its Implementing Rules and Regulations was also created. Disclaimer: Internet is one of the main modes by which PAGASA disseminates the Philippine Standard Time (PhST). There may be discrepancies with the PhST displayed here as compared to the PAGASA clock; the major causes being the internet transmission delay and the computer workload of the computer you are using. For a more precise clock synchronization, please call (+632) 9291237. What is Republic Act No. 10535? The Philippine Standard Time has the acronym PhST to distinguish it from the Pacific Standard Time (PST). When was it passed into law and who signed it? It was passed into law last May 15, 2013 and signed by President Benigno S. Aquino III. What does it aim to promote? The spirit behind the Philippine Standard Time touches on both technical and cultural aspects. The technical aspects aims to sync all time devices in the country so that its 7, 107 islands will have common time. Meanwhile, the cultural aspect aims to modify the so-called "Filipino time" (later than the scheduled time) attitude and develop the habit of being punctual as a show of respect to other people and to the value of time. Where can the general public get the PhST? Other reliable means that provide accurate PhST. Who are required to display and comply with the PhST? Peoples's organizations, non-government organizations and civil society groups. Airports, seaports, expressways; and government electronic boards and similar establishments. Who is tasked to monitor, maintain and disseminate the PhST? PAGASA's Time Service Unit, in coordination with the Department of Science and Technology (DOST). What are the time devicces required to display PhST in acordance with the official time being provided by the PAGASA using its Network Time Protocol (NTP)? Procurement of these time devices is supervised by the DOST, and the required specifications are issued PAGASA. Where should the PhST displayed? It should be prominently displayed in areas readily accesible to the general public. Do all time devices have to be exactly in sync with the PhST? Time deviation of plus (+) or minus (-) five (5) seconds with the PhST is acceptable. Private television and radio stations are required to display and broadcast the PhST. What if they fail to calibrate and sychronize their time devices? *First Offense - Fine of not less than thirty thousand (Php 30, 000.00) pesos but not more that fifty thousand (Php 50, 000.00) pesos. The collected penalty will be deposited in the general fund of the National Treasury. What if the government employee or officer responsible for the implementation of the PhST fails to calibrate and synchronize the devices with PhST? The employee or officer shall be administratively liable without prejudice to any civil or criminal liability that maybe appropriately imposed. How will the PhST be promoted to Filipinos? To promote awareness on the Philippine Standard Time, the government institutionalized the "National Time Consciouseness Week" to be celebrated yearly every first week of January. PAGASA and the Science and Technology Information Institute (STII) of the DOST, in collaboration with government agencies, shall organize activities for the observance of the National Time Consciouseness Week (NSTW). Government agencies through the CSC shall be encouraged to issue the necessary guidelines to all government offices to follow the PhST. In the celebration week, the pubic is likewise required to participate and cooperate in the activities, and encouraged to practice and promote a culture of punctuality and wise time management.